The children come home from school with Christmas handicrafts, write letters to Santa Claus with snowflakes on it and a Central European person may ask: really? 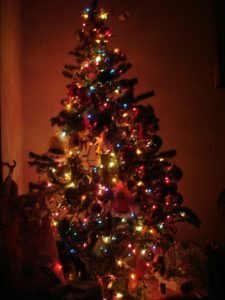 In many expat families, where au pairs in Chile are often placed, the mother begin to desperately look where to get some fir branches and cardamom and some wonder how to avoid a plastic christmas tree without crying children… Yet, the children generally are not bothered at all by a plastic tree – they look forward to any tree, as long as there is a lot of decoration and lights on it! Although Chileans are very fond of Christmas decoration, the time before Christmas is quite different here in other ways. Advent wreaths are largely unknown it is too hot for candles or baking cookies and the days get longer and longer… Christmas markets or at least craft stalls in parks have become more and more popular in Chile in recent years, but rather resemble a happy summer party with a few stray Christmas baubles, as a real Christmas market. The only thing that makes Europeans get a little bit into Christmas mood, are the many beautiful Christmas concerts organized in churches and sometimes in public places. 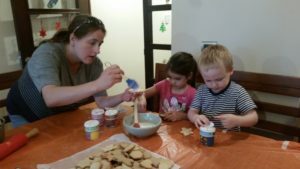 One thing the host families will love you Au Pairs for, and which is also becoming more and more popular in Chile, is to make advent calendars with the kids! In the big department stores, you can buy Advent calendars here and the Chilean children love this nes „tradition“- of course, who does not want to find a small treat every morning? With a self-made advent calendar you beat several birds with one stone as an Au Pair: you have a great activity for one or more afternoons (depending on the effort), you have a great result afterwards and the families will love you! So, there’s still time to collect the empty rolls of toilet paper or check out „friend google“, what you can do best with „your“ kids. We wish all of our current Au Pairs in Chile a wonderful advent season, even if it is completely different than usual! For those who want to experience such an „exotic“ experience and want to become Au Pair in Chile: Contact us! We organize your Au Pair stay in Chile with a nice host family. Of course, if your Spanish is in need of improvement, we will also organize a Spanish course in Chile for you. ← Springtime – off to the Park!